The trade of the 18 countries in the Greater Arab Free Trade Area (GAFTA) grew 11 percent in 2012 to $ 2.1 trillion, according to new IMF trade data. This built on two prior years of strong trade growth of over 20 percent. However, most of the increase is the result of higher hydrocarbon prices rather than increases in the real volume of trade, according to QNB Group. GAFTA has a high trade surplus versus the rest of the world with exports totaling $ 1.2 trillion in 2012 and imports $ 0.8 trillion. The trade surplus of $ 400 billion in 2012, or around 15 percent of GAFTA GDP, has grown steadily since 2009 when it contracted to $ 64 billion as oil prices averaged lower. GAFTA has been in force since 1998 and aims to support efforts to establish an Arab common market to encourage intra-regional trade and economic unity. It aims to help achieve these goals by removing barriers to intra-regional trade, primarily by creating a customs union and cutting customs duties. Under the agreement customs duties were eliminated within GAFTA in 2005, but this does not apply to all goods and significant non-tariff barriers remain in place. 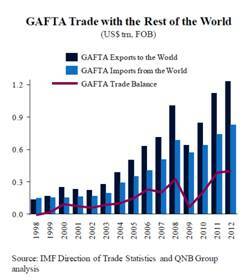 According to QNB Group, a key indicator for the success of Arab economic integration is the share of trade of countries within GAFTA with themselves relative to the total trade of these countries with the rest of the world. 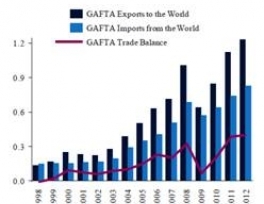 The GAFTA trade share rose from 9.3 percent of their total global trade in 1997 to 11.5 percent in 2010. It is hard to attribute this improvement to GAFTA as the intra-regional share was already rising prior its implementation, suggesting other factors could be at play, such as improvements in regional infrastructure, general economic development and other trade agreements. Since 2010, the intra-regional share has fallen to 10.7 percent in 2012, as a consequence of strong growth in hydrocarbon exports, which mainly go to countries outside GAFTA. Nonetheless, GAFTA does have the potential to boost economic integration once it is fully implemented with the further reduction of customs duties and other barriers to trade. It was hoped that a final agreement on a unified customs regime could be reached at the Arab Summit in Doha in March 2013, clearing the way for the full implementation of a genuine free trade zone by 2015. A proposal for such an agreement was completed by the Arab Economic and Social Council and just required the approval of Arab leaders. However, other regional issues dominated proceedings at the summit, leading to a possible delay in the full implementation of the free trade agreement. Arab intra-regional trade is dominated by Saudi exports. Roughly half of Saudi exports to the region are oil-related and much of the remainder are related to downstream hydrocarbon industries, such as petrochemicals, plastics, rubber and chemicals. Saudi Arabia is also an important regional source of manufactured goods and food with total food exports of $3 billion, mainly to the other GCC countries. As a global trade hub, the UAE is key to intra-regional trade. It is the second largest exporter to other GAFTA countries — non-hydrocarbons account for around 60 percent of UAE global exports. The UAE also imports more from within the region than any other country, mainly from Oman, Saudi and Sudan. However, around 38 percent of exports from the UAE are re-exports, mainly from countries outside GAFTA. This suggests that at least US$8bn of intra-regional trade is, in fact, originally sourced from outside GAFTA, only passing through the UAE. Similarly, the bulk of Saudi Arabia’s re-exports (estimated at around $ 7 billion for 2012) are probably directed to GAFTA. These re-exports complicate efforts to measure genuine inter-regional trade. The UAE accounts for the two of the strongest bilateral trading relationships in the region, conducting $12 billion of trade with Oman (around 6 percent of total intra-regional trade) and $ 7.2 billion with Saudi Arabia (around 3 percent of intra-regional trade). In 2012, Qatar’s strongest trade relationships were with the UAE ($ 3.5 billion) and Saudi Arabia ($2.2 billion) and 83 percent of Qatar’s intra-GAFTA trade was with the GCC. With regards to non-GCC GAFTA countries, Qatar’s leading trade partners were Lebanon ($ 597 million) and Egypt ($ 420 million). It is likely that a free trade agreement within the GAFTA countries will be implemented in the near future. The reduction in customs tariffs likely to result from an agreement would help to further boost intra-regional trade, which will also continue to be supported by general economic development and improving trade infrastructure across the region.